We are all having a fun loving heart inside; everyone wants to be over enjoyed while being outdoor in summers and outdoor baths and showers are the best ever fun activities to double up the summer entertainments! Want a swimming pool at outside? This is really a luxurious thought and one show own a lot of money to think about such and outdoor improvement and fun plans! Now everyone can have a poolside at his outdoor, garden or backyard places and no higher amounts are required here, you will get all at a friendly-budget! 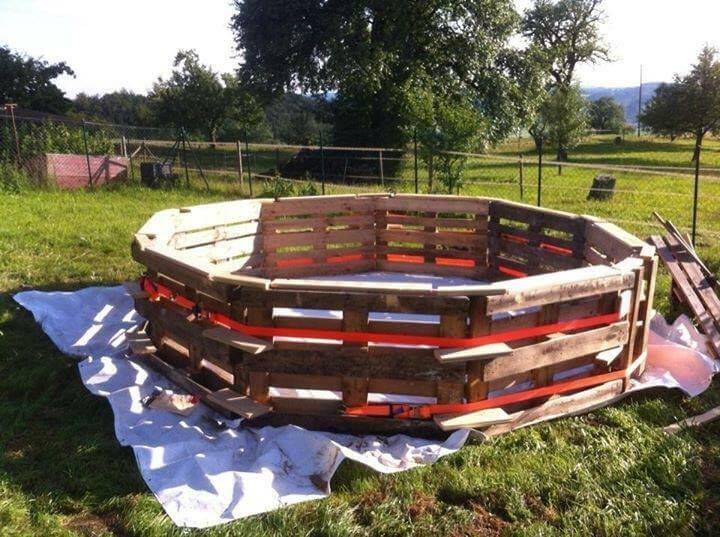 Get inspired of this DIY pallet swimming pool made of old and reclaimed material wholly! 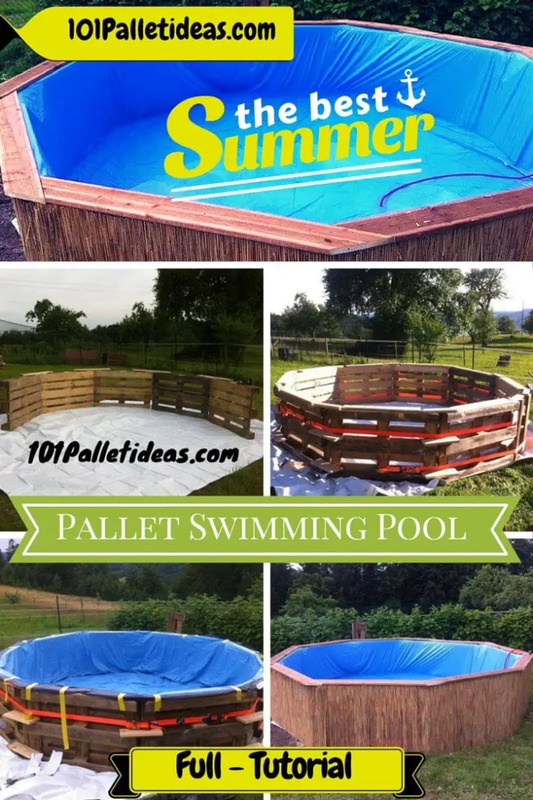 Get some pallets (at-least 12 ), plastic cloth, tape, nails, a blue spread and nuts and bolts and clone this pool inspiration to have summer-friendly outdoor or backyard! 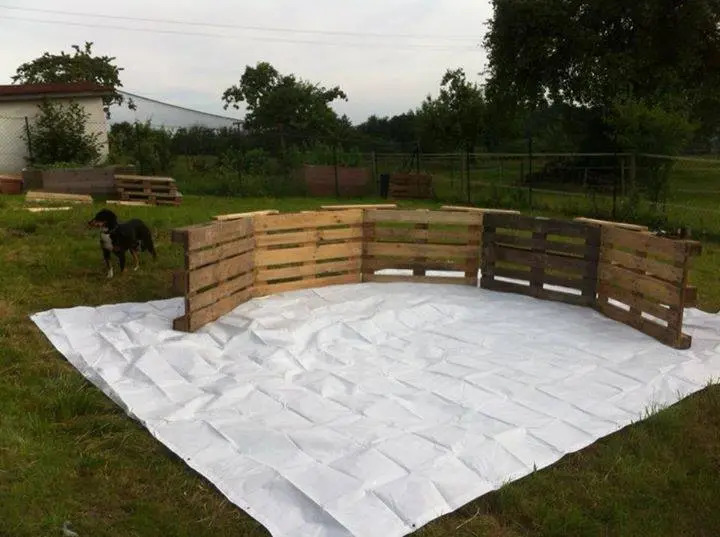 One can call it another creative pallet recovery and a great recycling achievement and also a way to bring the pallets again in functional and serviceable conditions! Floor up a plastic cloth and line the whole pallet up on it! This is how to start the outdoor pool construction, plastic fabric is having water proof nature and would really make the base of the pool! 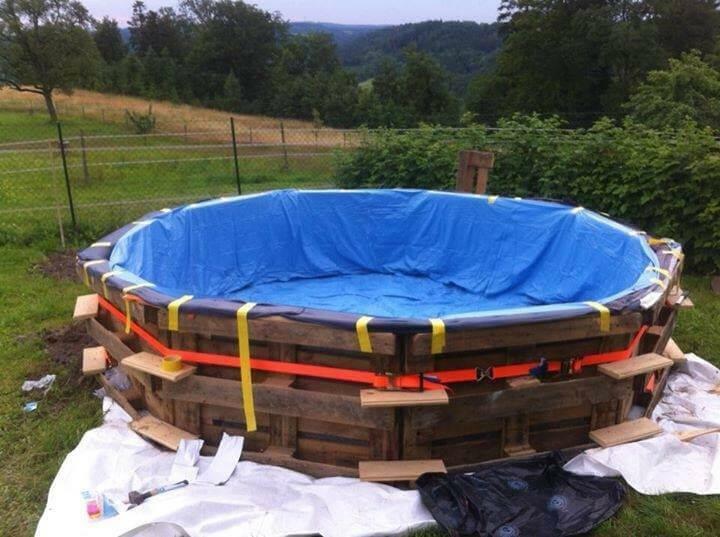 Keep on lining the pallets up until you get a fab circular shape of your pool! You can go for any of geometrical shape but this like circular or octagon one will really rock! Use the latest hardware to assemble all, wrap the tape around the joints and joints for a tight grip and also add the wooden supports to let the structure unbeatable! For interior water retaining section, blue plastic cloth has been selected and has been spread around the top of of interior edges! This will really give an appreciated bluish swimming pool water look! After add finishing up the interior of the pool also complete the outer side of it for a complete and gorgeous finally finished look! 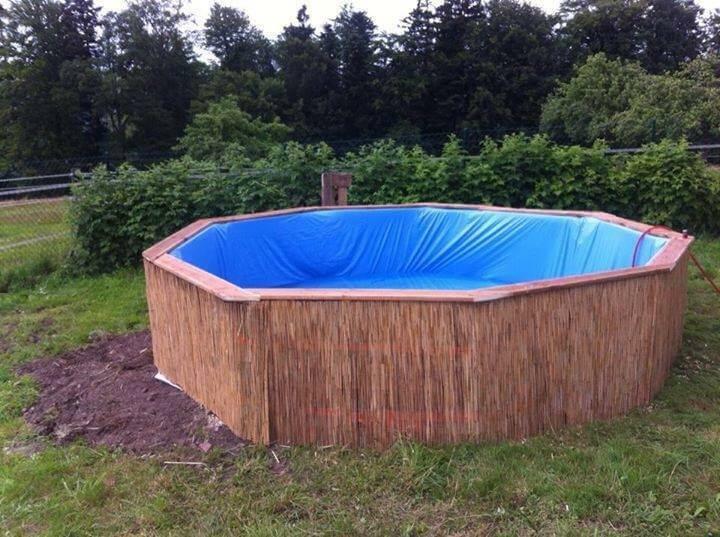 For outer part of the pool, cane reed fence panels have been installed to whole of the round boundary for a charming outdoor-friendly look! 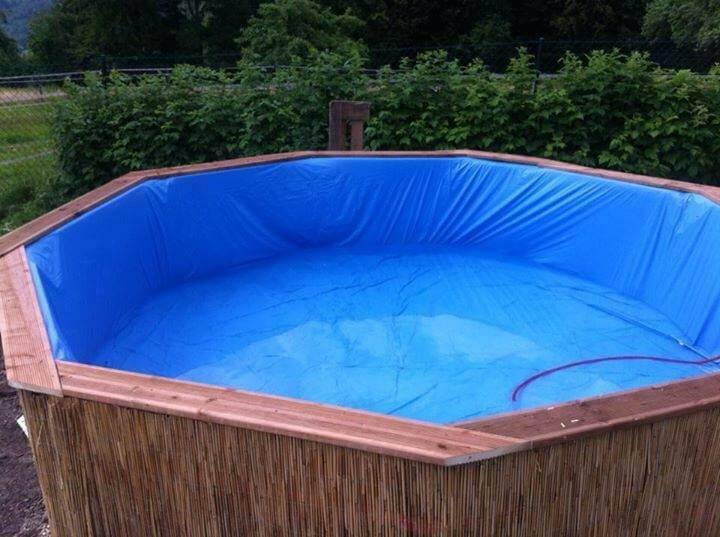 One can also use the same plastic fabric to accentuate the outside which has been used for interior blue lining of the pool! 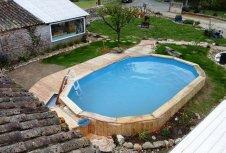 After you complete all, give the decorative edges to the pools or make the wood scorched to be more eyeful! Make sure that there in no hole inside for water leakage and then fill the pool with pater to the top and dive into the pool to say good bye to killing hotness of summers! Also get you kids and friends inside to double up your fun!